The Wakulla County School District is a verifiable standout in Florida, underscored by its students’ academic and other achievements, high graduation rates (92 percent in 2017), and consistent A and B grades from the Florida Department of Education. No insignificant feat for a small, fiscally constrained rural county. The secret to the success, school district administrators say, are general buy-in into education; dedicated, largely autonomous teachers; and a collegial, forward-thinking leadership. “Our focus is on helping students be the best they can be, and that starts with providing them with as many opportunities as possible to give them reasons to buy into their education,” says School Board member Melisa Taylor. 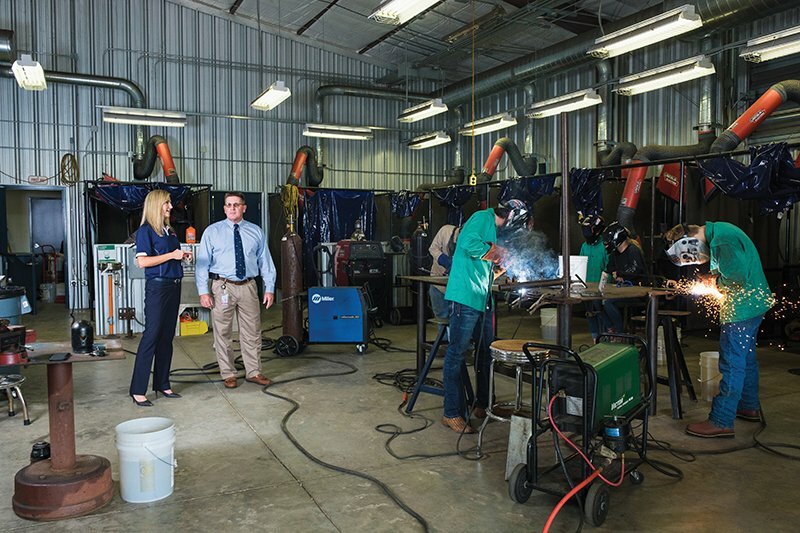 The two initiatives, the career-and-technical education (CTE) and dual-enrollment programs, plus the high graduation rate, officials say, account in large part for Wakulla County’s increased median household and per-capita incomes, as indicated by U.S. Census Bureau data. Such economic results undoubtedly contribute to the buy-in into education that administrators cite as one of the key ingredients to the district’s success. Which comes with job satisfaction, another key ingredient. A cordial, respectful relationship between the board and superintendent is another critical element. “Some people question whether we’re ‘yes people’ because we agree on so many things,” Taylor said. “But my role is not to argue in front of the public or ask so many questions that it sounds as if I don’t know what I’m doing. It’s my job to do the homework and come prepared to meetings.” Brock agrees. Pearce affirmed the professionalism and cordiality. And if an item raises concerns, he will pull it from the agenda, revisit it and often resolve or clarify the problem, so that it passes upon resubmittal, he said. The biggest challenge, all agree, is money. This goes to visioning and forward-thinking leadership. Case in point: the millions of BP settlement money from the 2010 oil spill that the district is getting to build a Career/Technical Education Center and a Learning Center at Wakulla High. The first, in partnership with Lively Technical Center, will house two CTE programs initially, with more to be added later. The second, together with TCC, will allow students and adults to pursue AA degrees. In fact, the $3.7 million for the first project has already started flowing, with a portion earmarked to buy computer equipment to start industry certification in K-5, says chief academic officer Sunny Chancy, who is spearheading the effort. Other school districts would do well to borrow a page from Wakulla’s playbook.